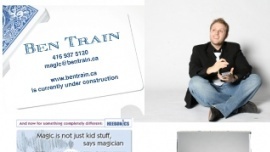 Ben Train, a young award-winning magician (and my son) would like to develop his website, bentrain.ca. Currently there is just a placeholder and the logo is the corner of a playing card. Ben specializes in walk-around card magic for adult parties and corporate events. He is also a teacher and lecturer, publishes books and DVDs and is about to release a movie. One area that also differentiates him from other magicians is his scholarly approach to the discipline. As a philosophy and English major, he has studied the classic texts and has developed a reputation as a magic historian. Age: 10 and up (when many young folks start getting interested in magic). Emphasis on adult. Gender: Magic tends to attract males, although there are definitely female magicians. Income: Since we want to attract corporate clients and those interested in the academics of magic, we don't want a cutesy logo (no clipart of pulling a rabbit out of a hat!). Education: Average audience age and education would be university/college and up. Locale: Urban, global (he travels to lecture). Practicing magicians who are looking to purchase Ben's dvds and books. New magicians (including children) who want advice on getting started in the field. Clients looking to hire Ben for shows or lectures. I am still working on collecting fonts but seem to be gravitating towards either reverse font or a font with an inner design. I also like fonts with a bit of seriph or even unusual design. I gravitate towards rich greens, blues and purples, the cool colours. I particularly like the effect against a dark background. Many of these colours are related to electriciy (flashes of blue and white on a black background) to represent the wonder and out-of-the-normal feeling that magic can give. I think dramatic combinations might be appropriate, as well, since magic is about drama. I like something sophisticated with a touch of cleverness. A combination of a graphic and text, probably with a sub-text as well.